On June 2, 2018, guests joined Atlas Obscura and the Untermyer Gardens Conservancy to experience the wonder and beauty of Untermyer Gardens. In this enthralling evening filled with exploration and performance, guests entered a hidden world of wonder and beauty inspired by the gardens' architecture, design, history, and lore. Attendees found themselves transported back to the golden years of the Greystone Estate, when Mrs. Minnie Untermyer hosted some of the greatest artists and performers of the early 20th century and Samuel Untermyer roamed the property with a white orchid in his lapel. At dusk, more stories were revealed. When Untermyer passed in 1940, the daunting cost of upkeep left his former gardens unmaintained, eventually falling into ruin. Victim to vandalism and overgrowth, by the mid-1970s Untermyer Park had gained a dark reputation as a gathering place for occult activities. 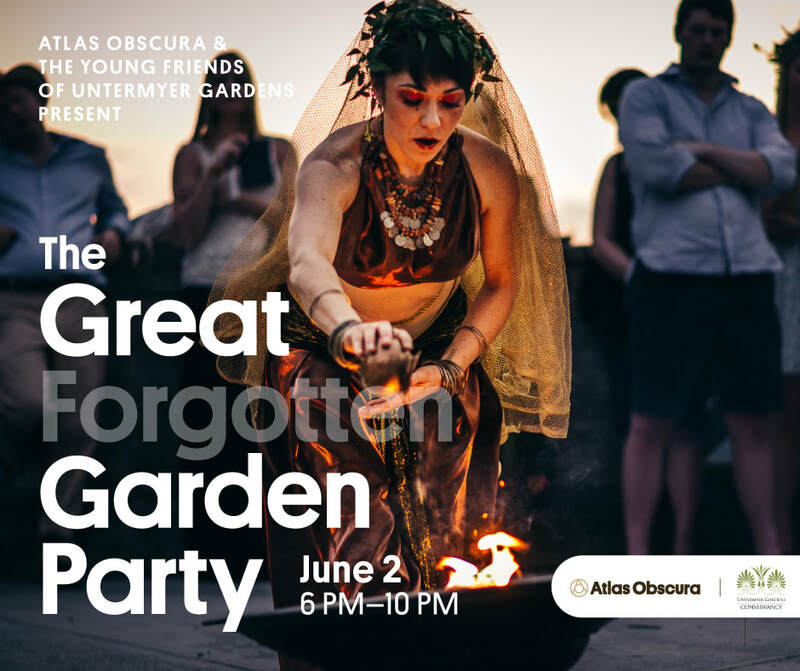 Brought to you by the curators behind Into the Veil, The Great Forgotten Garden Party invoked the past in this hidden garden oasis, revealing a world of music and dance where ancient mythology and modern legends entwined.